A warm and friendly welcome awaits you at services in St. Mary Magdalene, Crowmarsh Gifford, a beautiful Norman village church in the Wallingford Team. Our Sunday morning services are all at 11.00am. On the first Sunday of each month we have a Family Service where children and families are especially welcome. On subsequent Sundays Parish Communion is celebrated. Periodically a Team Communion is celebrated in one or other of the three parishes in the benefice. 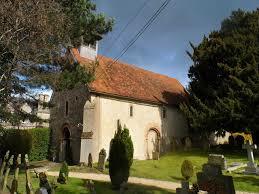 In addition we hold two or three services at the church of St Mary in Newnham Murren in the summer. See the church noticeboard or the calendar of events for more information. Please note that we have no toilet or baby changing facilities available (yet, but we’re working on it). Our Advent and Christmas services are also found on the “A Church Near You” website. 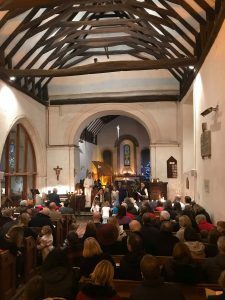 History: The church was originally built in the early 12th century, possibly as the chapel of a leper colony under the care of Wallingford Priory. In 1140, it was used as a fortified post by King Stephen in his wars with Matilda who held Wallingford Castle. During the Civil War it was used by Cromwell’s men to shelter from the Royalists (there are cannon ball holes in the vestry door to prove it!). VCH are in the process of producing comprehensive histories of our churches, see: www.victoriacountyhistory.ac.uk/sites/default/files/work-in-progress/crowmarsh_religious.pdf for St Mary Magdalene, Crowmarsh Gifford; www.victoriacountyhistory.ac.uk/sites/default/files/work-in-progress/newnham_religious.pdf for St Mary’s, Newnham Murren. We have produced a Statement of Significance and Needs which details our current thinking on how this project could be taken forward. We hope to carry out a feasibility study in 2018 to work through the practical challenges that this will entail. The church is open during daylight hours and we are happy to unlock the church and/or meet visitors at other times – just contact the Team Vicar. You are also most welcome to join the Team Vicar for Morning Prayer in the church at 9am on Fridays. Crowmarsh PCC’s Data Privacy Notice is available here and a consent form here.